Toasters are ordinary. 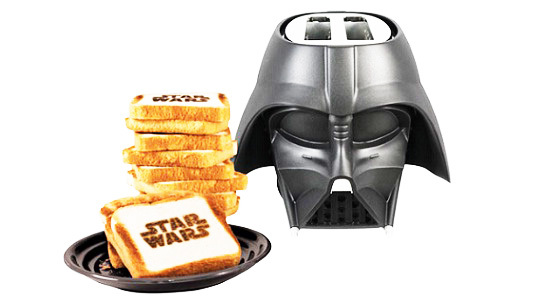 What I have for you today is is your favorite Star Wars Darth Vader Toaster you were been looking for. Its a compact two-slice toaster with cool-touch housing reheat, defrost and quick stop function. With an adjustable thermostat and automatic manual switch-off function, you won't miss your breakfast ever. With Darth Vader at the helm, The Star Wars franchise is among the most recognizable brands on the earth. Molded in sturdy black plastic and meticulously detailed design, the Darth Vader toaster will make a perfect addition to your kitchen. Pop in two pieces of bread, frozen pancakes, hamburger buns or English muffins, in few seconds Vader ejects them with the Star Wars logo right on top of it. Its officially licensed with removable crumb tray for easy cleaning and 110-120V 60Hz 570-680W power supply.